In October I planted 14 Photonia Trees. These were mature 3 metre plus trees that were in pots. A couple of them looked like they were suffering from spot when they were delivered and have suffered badly with leaf drop and are looking pretty bare. I plan to feed all the trees with liquid feed every two weeks from April / May? However I’ve noticed some of the healthiest trees are starting to suffer and lose leaves and look less healthy. I’ve watered them as directed since I’ve had them but I’m receiving mixed reports on how much I should water them? I’ve read as much as 5 gallons 4 times a week each? I’m also concerned I don’t want to over water them? Can anyone advise me on this? Looks like the same garden. I think you may be right Dove ! Must admit l didn't look too closely at the photos, just knew it rang a bell. Apologies. It is the same garden. I should have mentioned before. My Gardener posted before but I didn’t read any specific information on the amount I should be watering the trees. Hi Darren, it depends on what your soil is like. If it's free-draining or if the border was properly prepared before planting, it's pretty much impossible to overwater. On the other hand, if you have clay soil and the trees were just planted in holes rather than the whole area being dug over and improved, the planting holes will act as sumps. Where I live in Essex the soil does contain a lot of clay. 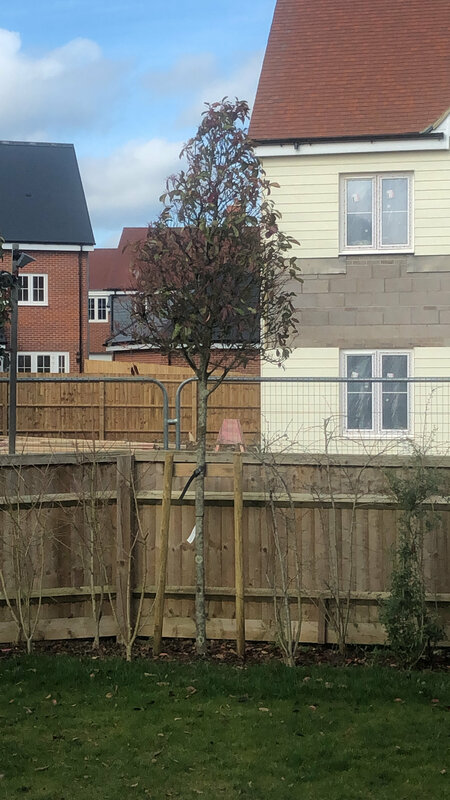 Each tree had a large hole dug (which took quite a few hours each) but a large amount of top soil, compost and farmyard manure was put down to give the trees the best chance. I totally understand your point re a sump so how often would you water them in those conditions. The trees that are struggling just seem dry? Im sorry if I’m asking silly questions but I’m not a gardener. I'm sorry Darren, I couldn'really say. My garden has sandy soil that drains like a sieve even with compost etc. added, so it's the opposite problem. Hopefully someone who can help will be along soon. When you say the trees ‘seem dry’, do you mean the leaves are dry or the soil around them? I don’t water anything planted in the ground during a relatively normal winter ... not even recently planted trees ... and we’re on free-draining gritty loam over chalk. If you scrape the surface of the bark very gently with your thumbnail is the next layer green? If so then at least your trees are alive. No problem Darren, l thought it was a coincidence that someone was having a similar problem , l doubt that you are the one after the dry summer we had. Hopefully the replies on the other thread helped a little. This may sound a little drastic, but would it be possible to dig one up? This means you can get a good idea of what exactly they're planted into, and also see how the roots are getting on. You can post photos on here for more advice, and to be honest l don't think you have anything to lose.